Have you tried any of Graham Norton’s wines? Yes that Graham Norton of TV’s ‘The Graham Norton Show’ fame. Well, the wines are made here in New Zealand by the innovative crew at Invivo with Graham as the overseeing winemaker. When it’s blended to his liking that’s what goes in the bottle. 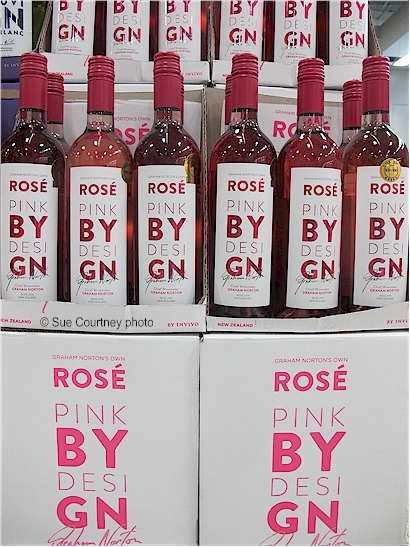 His latest offering, Graham Norton’s Own Pink By DesiGN Rosé 2016, has prime positioning in my local supermarket at the end of a stack and alongside his Own SauviGNon Blanc 2016 is almost the first wine you sight on your supermarket circuit. It’s a crisp, refreshing, moderately dry, light styled pink made from a blend of Marlborough pinot noir and Hawkes Bay pinot gris grapes with the flavours offering up raspberry, citrus and pear skin notes with just a whisper of sweetness. I tasted the wine and popped it in the fridge hoping someone would call around and I could offer them a glass. That’s one of the good things about screwcaps and young, fresh whites and pinks – unscrew the cap, pour a glass, screw the cap back on, pop the bottle in the fridge – they’ll last up to three weeks easy. Now I wanted something to accompany a Butter Chicken Curry. My first choice match was a failure (see this post) but this crisp chilled pink turned out to be perfect. I never woulda thought? Funny how things turn out. So thanks Graham Norton, now I know that I can match a fairly dry light rose to a butter chicken curry. A first but not a last. RRP $18.99 but the supermarket’s ‘special’ price was $13.98. This entry was posted in #nzwine, hawkes bay, marlborough, rose and tagged 2016, Graham Norton, Invivo, Pink by DesiGN by Sue Courtney. Bookmark the permalink.